This website, and any information contained in it, is not intended to provide or constitute legal advice. You should not, in any circumstances, rely on the legal information obtained through or from this website without first consulting with us. If you would like to discuss a specific legal matter arising in or related to one of the jurisdictions where we maintain offices, please contact one of our lawyers any of whom will be pleased to determine whether our firm can act on your behalf and provide with you legal assistance. If you are in a jurisdiction where we do not practice, consult competent consult in your own jurisdiction. The content and the copyright in the content is owned by Lawson Lundell LLP. You are provided with a limited licence to use the information for the purposes set out herein. You may display on your computer, download or print a copy of the material from our website for non-commercial, personal or educational purposes only. You may not however modify the content, and where you do copy it or use it for educational purposes, in doing so you agree to identify the source as Lawson Lundell LLP, Barristers and Solicitors and shall note the limited licence provided. Documents on this website may not be reproduced or transmitted for any purpose, other than the purpose for which they are set out on the website without our prior written consent. Applications to do so should be directed to privacyofficer@lawsonlundell.com. Email communication between you and Lawson Lundell LLP may not be secure. We recommend that all email be encrypted to increase the security of your communications. 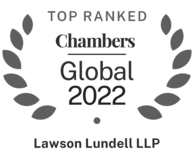 Sites that are linked from this website are not under control of Lawson Lundell LLP. We do not assume any responsibility or liability for communications with or materials obtained from any linked sites. 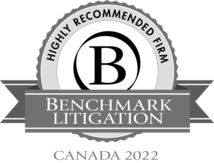 Links are provided solely for your convenience and are not an endorsement or referral by Lawson Lundell LLP. If you wish to provide a link to our website, please contact genmail@lawsonlundell.com to make a request. 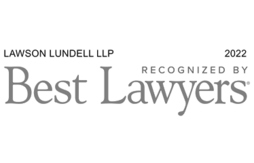 You may not use our icons or logos on your website without our express written consent and you may not use any links to suggest that Lawson Lundell LLP, sponsors, endorses, approves or is affiliated with you or your website. Terms and conditions of your access to and use of this website and any claims made against Lawson Lundell LLP, its partners, employees and representatives or affiliated companies arising out of such access or use or otherwise will be governed and construed or interpreted in accordance with the applicable law of the jurisdiction where we maintain offices, as the case may be, and you are located. If you are not located in a jurisdiction where we operate, then the applicable law shall be that of British Columbia. Lawson Lundell reserves the right to amend this website and its conditions at any time, including the right to revoke any and all permissions and licences. Save a notice to the contrary by the recipient or the existence of special circumstances, the use of email is considered by the present users as an adequate means of communication, equivalent to regular mail. E-mail messages are considered to have been received when they enter the information system of the addressee. The e-mail message from which you accessed this disclaimer and any attachments to that e-mail message, are confidential, may be subject to solicitor-client privilege and are intended only for the addressee. Any unauthorized use or disclosure is strictly prohibited. Disclosure of such e-mail to anyone other than the intended addressee does not constitute waiver of privilege. If you have received such communication in error, please notify us immediately and delete the email. Thank you for your cooperation. If you prefer not to receive these types of communications from us, send us an e-mail with the statement "Unsubscribe" in the subject line at genmail@lawsonlundell.com, or send a letter to Lawson Lundell LLP Attn: Marketing Department, Suite 1600, 925 West Georgia Street, Vancouver, BC, Canada, V6C 3L2.